One of the main reasons why WordPress has become so popular in the recent years is due to the wide range of plugins at your disposal. However, with so much choice, narrowing down the best WordPress plugins for you needs can be overwhelming. Thankfully, you don’t need to look very far to find the best WordPress plugins. For starters, many free solutions can be found in the WordPress.org Plugin Directory. They enable you to add functionality such as website security, social sharing, site backups, and much more. 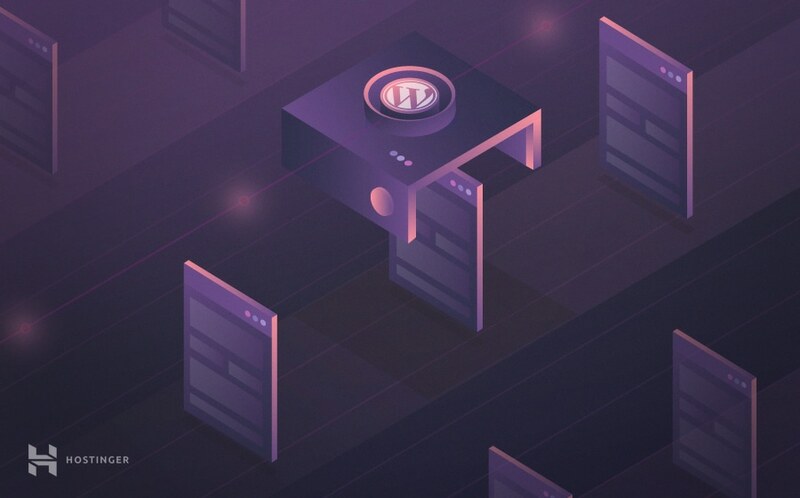 In this article, you’ll find 14 plugins we believe every WordPress website owner and developer should be aware of in 2019. Without further ado, here are the plugins that could help you the most this year! Powering almost a third of all e-commerce websites, WooCommerce is one of the most popular WordPress plugins for those who want to set up an online store. This e-commerce plugin makes it easier to sell a wide range of physical and digital products to customers all around the world. It also includes a huge extension library, at a range of prices. 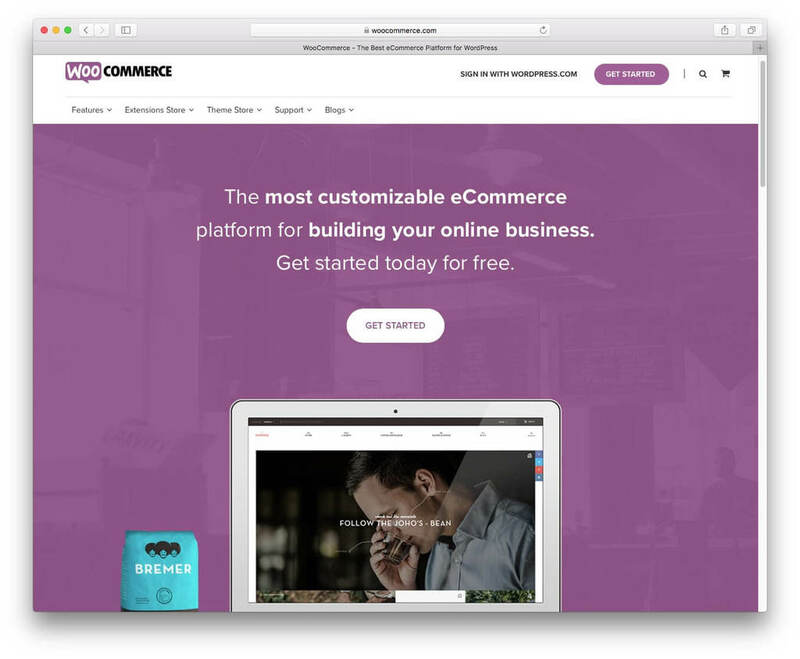 What’s more, given that 51% of Americans prefer to shop online, having a quality foundation in WooCommerce for your storefront is crucial for success. Website owners and developers who want to sell products or services through their WordPress websites. 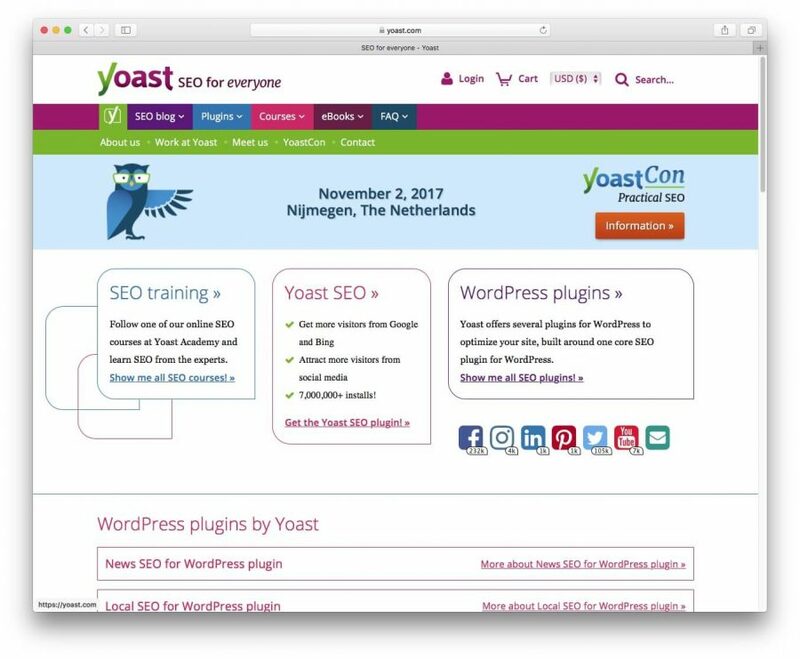 Considered to be the best WordPress plugin for Search Engine Optimization (SEO), Yoast SEO is designed to help you publish higher-quality, search-optimized content. Because the SEO landscape is often changing, it’s important to employ a stellar plugin to keep ahead of the curve. Yoast SEO operates via a unique traffic light system, clearly showing you how your content will fare with search engines. In addition, you can also assess the readability of your post, meaning that not only search engines will be happy, your readers will be too. While Yoast SEO is a completely free plugin, there’s also a premium version available, starting at $69. Analyzes WordPress pages and posts and identifies SEO weaknesses. Updates page analysis results when the appropriate SEO changes are made. Creates breadcrumbs on compatible WordPress themes. Those who want to conquer the front page of the most popular search engines. In a nutshell, a slow website has a dire effect on your traffic, and consequently your sales. To combat this, you’ll need a caching plugin such as W3 Total Cache. In short, this plugin saves a version of your site’s pages on your visitors’ computers, meaning your site will load quicker on subsequent visits. It’s a vital weapon in the fight against slow browsing speeds, especially with increasing mobile usage in 2018. Compatible with a wide range of hosting solutions (runs perfectly on Hostinger) and servers. 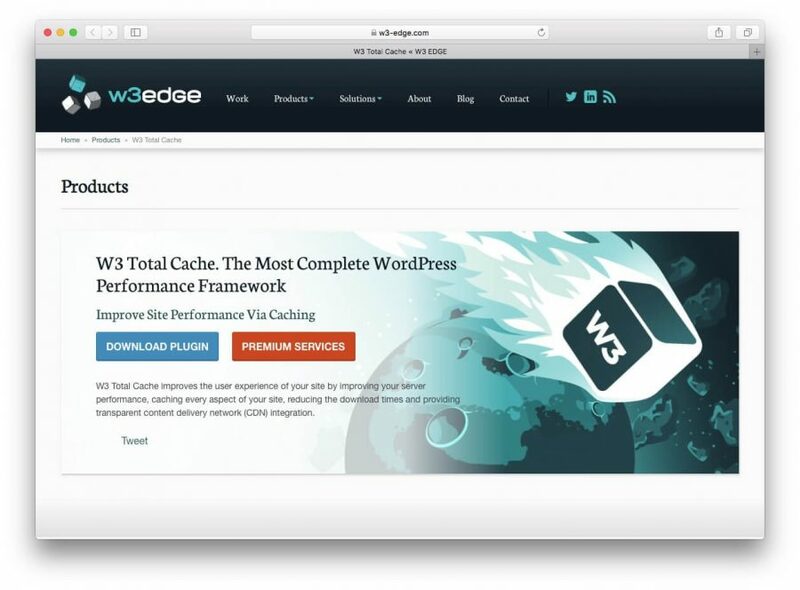 Caches most elements of a WordPress website. Website owners of all stripes who want to speed up their website. 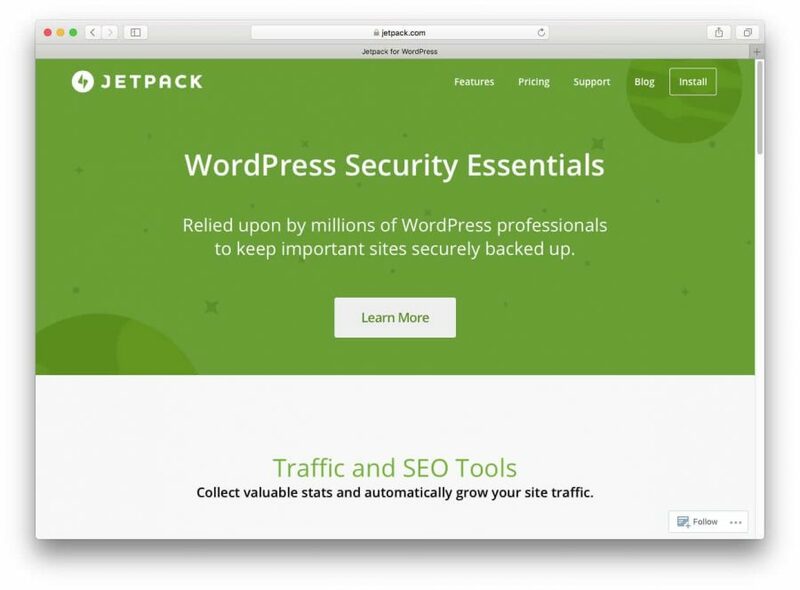 Jetpack is a solution from the developers of WordPress, designed to help you generate more online traffic, secure your website, monitor performance, and much more. It consists of a number of modules that can be activated (or not), and sets itself up as a one-stop shop for additional WordPress functionality. The core features of Jetpack are completely free. However, a premium version of this plugin offers backups and additional security scanning, along with a myriad of other features. Analyzes and produces website statistics. Monitors website downtime and uptime. Lets visitors interact with you and your content through social sharing, advanced commenting, and a stylish contact form. If you need a wealth of simple-to-use functionality at your fingertips, Jetpack is ideal. Online security breaches are on the rise and hacking attempts are common, so it’s essential to use robust security measures. One popular method is Two-Factor Authentication (2FA), which enables you to verify your identity through your smart device. 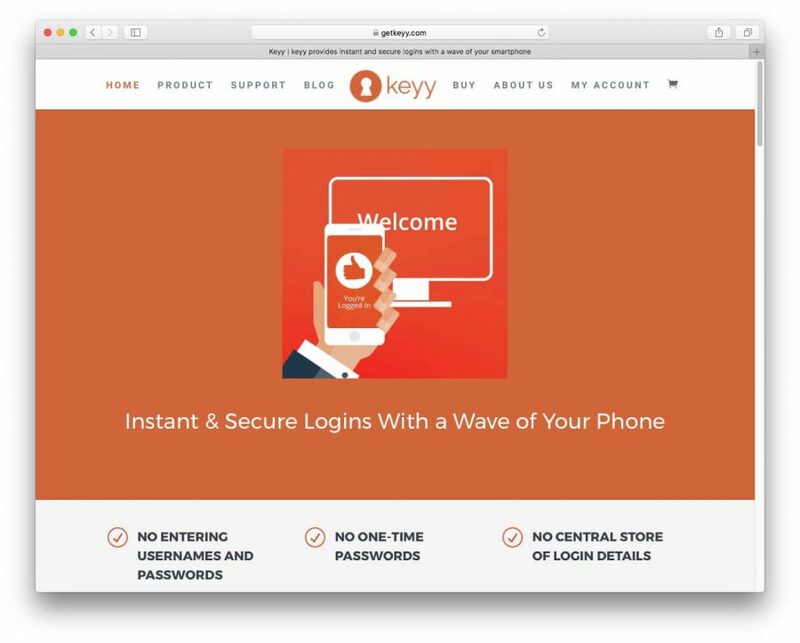 The Keyy Two Factor Authentication plugin is one of the best solutions available. Once installed, this plugin enables you to log in to a WordPress website using your smartphone. You’ll also need to download the corresponding app for you device, from which you can create a pin number or record your fingerprint. When logging in, simply open the app, and point your phone at a code that appears on screen. There’s a premium version of this plugin available, but the free version should be enough for most users. Removes the need to enter a password. Creates and stores a 2048-bit RSA digital key on a smart device. Protects a website from unauthorized access. Enables you to access all of your WordPress websites with one click. For the security conscious, Keyy is going to be a vital part of your workflow. As the name suggests, Broken Link Checker looks for those links that could cause a 404 error on your website. This is extremely important, as your site could be penalized by the major search engines if it includes too many missing or broken links. 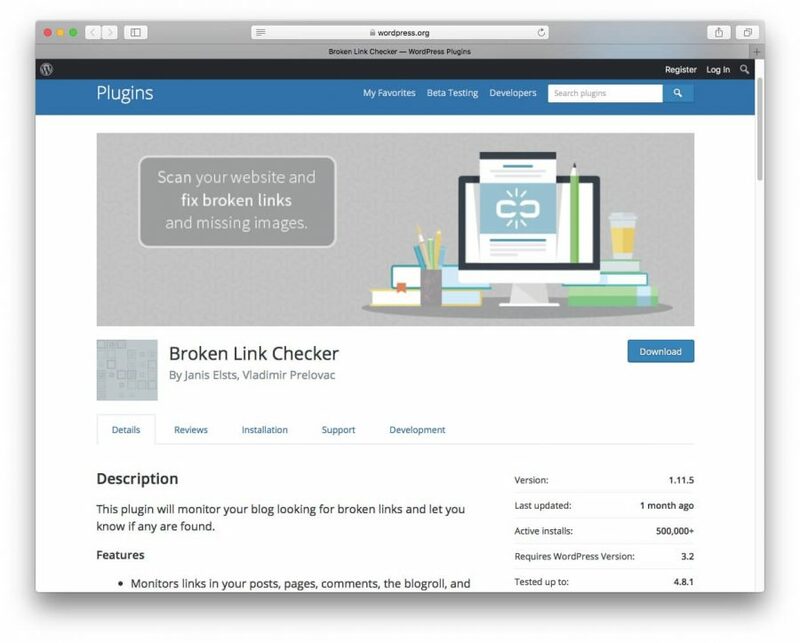 Once installed, the plugin will monitor your site for broken links and provide a report in your WordPress dashboard. From there, you can edit the link in question, or otherwise dismiss the notification. Also, it will take a while to run an initial check (especially if you have a large website), but you can check its progress again via the dashboard. Monitors your site for broken links. Notifies you if there are issues, both through email and the WordPress dashboard. Stops search engines from following broken links. Those who want to optimize their website, and make sure their search ranking is as good as it can be. Contact forms are a key way to enable conversation with your users and potential customers. 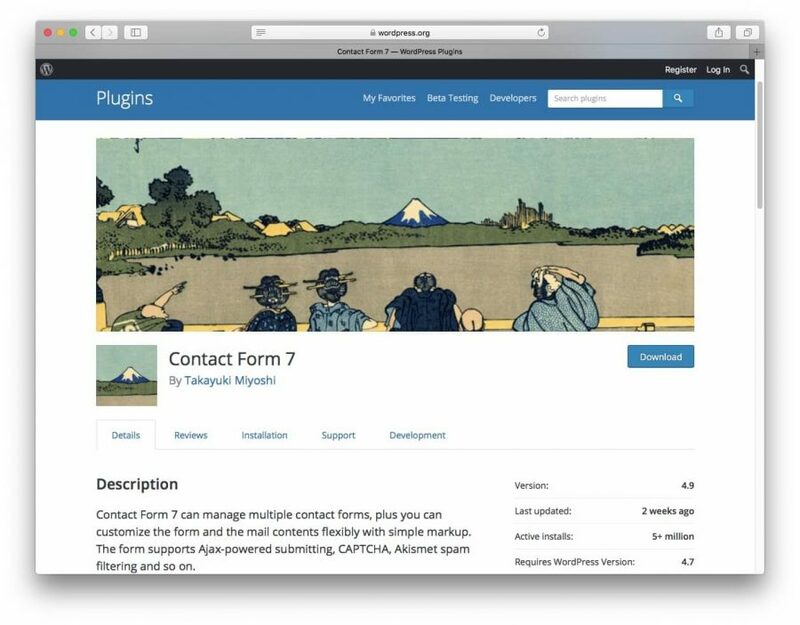 With that in mind, the Contact Form 7 plugin lets you add one or more customized forms to your WordPress website. Contact Form 7s design makes it simple to deal with customer queries, suggestions and other messages submitted through a website. In addition, with the ability to support CAPTCHA, Akismet and Ajax-powered submissions, your security isn’t compromised, and your inbox can remain spam free. Lets you manage multiple WordPress contact forms. Helps prevent spam using CAPTCHA and Akismet. Site owners who wish to display stylish contact forms, without sacrificing functionality and security. Given the competitive nature of doing business online, monitoring your site analytics is a must to stay ahead. 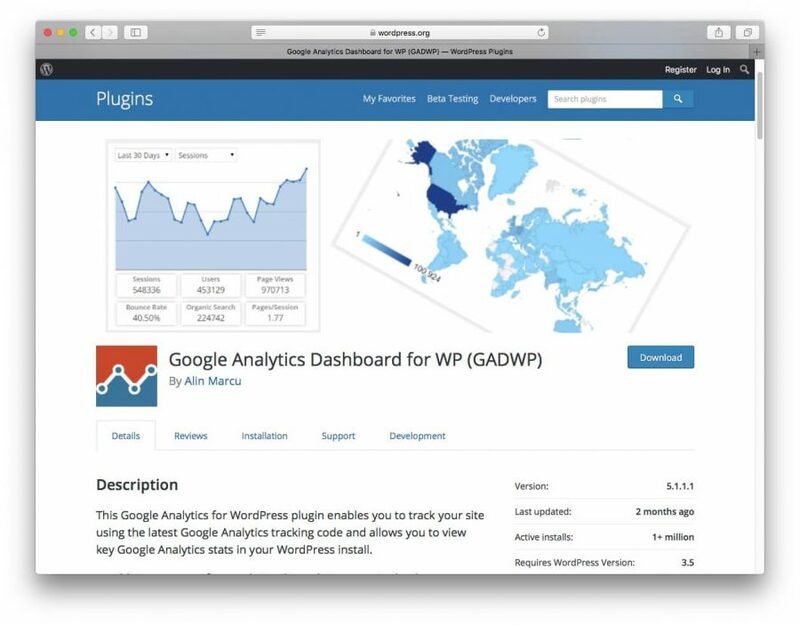 The Google Analytics Dashboard for WP plugin will help shed light on your website’s activity, directly from your WordPress dashboard. The installation process is simple, and once complete, you’ll find a dedicated panel on your WordPress home screen. While other similar plugins are available, GADWP provides a more stylish layout, along with more metrics to track. It’s ideal for those who need as much information as possible at their fingertips. Reports visitor details in real time. Offers access to specific Google Analytics reports. Internet marketers and site owners who need to monitor how their sites are performing, in real time. 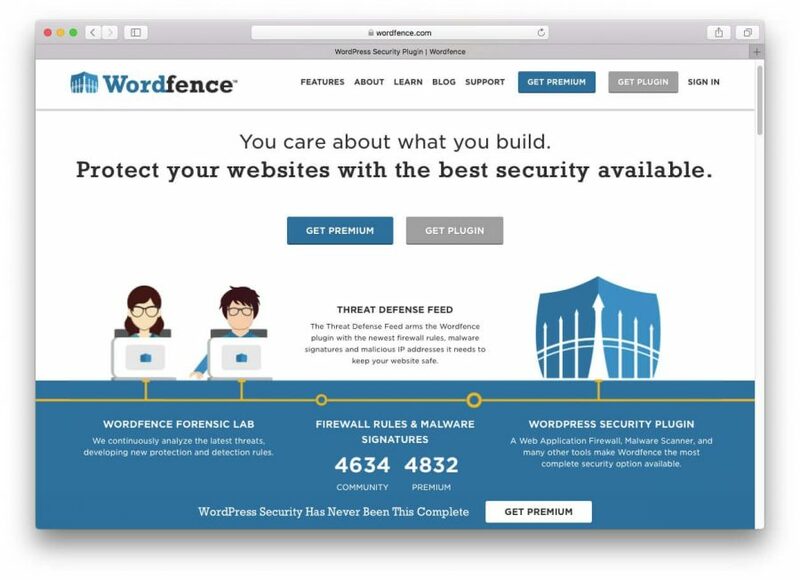 Wordfence Security is an all-in-one plugin designed to protect your WordPress website from a wide range of online threats. It’s arguably the most popular security plugin for WordPress, which will be invaluable when dealing with the latest security threats. For starters, it includes a continually-updating Threat Defense Feed, which protects your site with new Web Application Firewall (WAF) rules, malware signatures, and much more. What’s more, there are features to help you blacklist and whitelist IP addresses, block users and countries automatically, and on their premium plan, implement 2FA for all users. Recognizes and blocks online threats. Provides constant monitoring of your website. Works from a regularly updated database of malicious threats. Practically anyone who wishes to protect their website comprehensively from malicious intent. While it’s been a factor for a number of years, given the prevalence of mobile browsing in 2018, a slow-loading website is not option. Images with a large file size are often a big culprit, so a solution such as the Imagify Image Optimizer will be crucial for keeping page size (and consequently speed) down. This plugin is largely automatic, in that it will scan and optimize any images within the WordPress Media Library. Although there is a limit on how many images can be optimized for free, there are a range of premium plans to suit your requirements. Compresses website images based on three algorithms. Restores images to their original state upon uninstall. Automatically optimizes images in the Media Library. 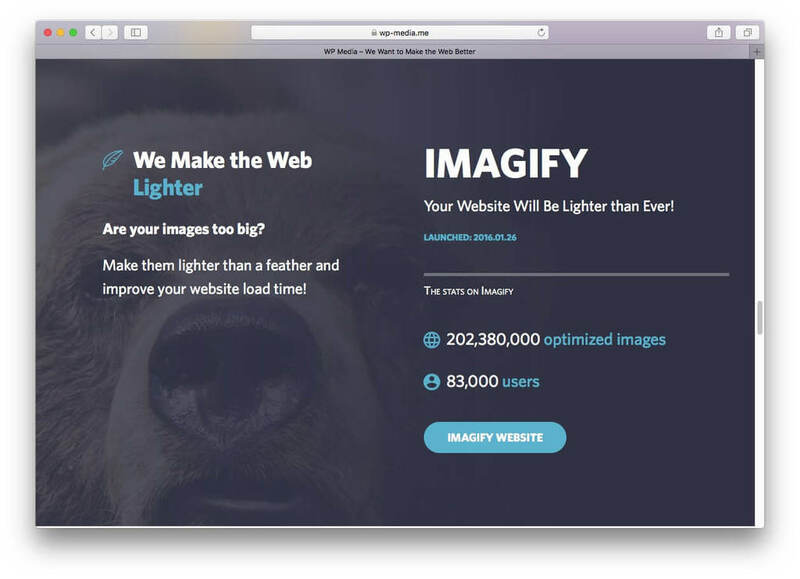 For those who worry about how quickly their page loads, or if you offer a media-heavy website, Imagify Image Optimizer will be ideal. 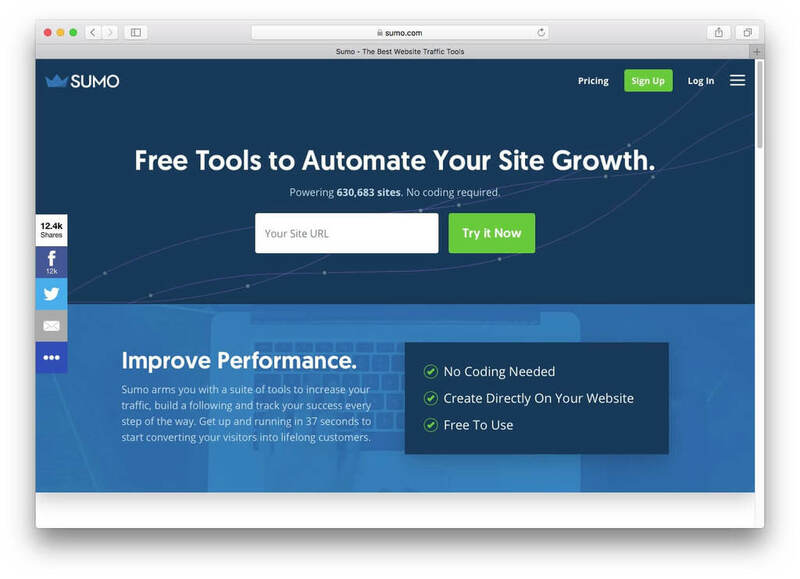 Much like Jetpack previously, Sumo is a collection of free tools to help enhance your website’s functionality. However, this focuses solely on visitor interactions, rather than any other site aspect. For example, you can implement social sharing for content, generate heat maps, provide a number of pop-up options to help build subscriber lists, and much more. What’s more, Sumo can be integrated with most leading autoresponders, including AWeber, MailChimp, and Constant Contact. Offers a suite of social interaction tools. Enables you to analyze your visitors’ activity. Online marketers who want to increase traffic with a number of powerful tools. Backups are a perennial requirement for all website owners, and finding a quality solution should be one of your first tasks once you go live. With that in mind, UpdraftPlus is one of the most popular (and powerful) backup plugins available. This plugin provides scheduled and automated backups out of the box, to a variety of different storage options such as email, Google Drive, and Dropbox. Backup and restoration can both be carried out with one click, and the developers have made sure the resources used by the plugin are minimal. Finally, there’s also a premium version of the plugin, which adds further storage options, along with a multitude of other features. Backs up and restores sites with one click. Provides automated scheduling of your backups. Enables you to save to a myriad of storage locations. 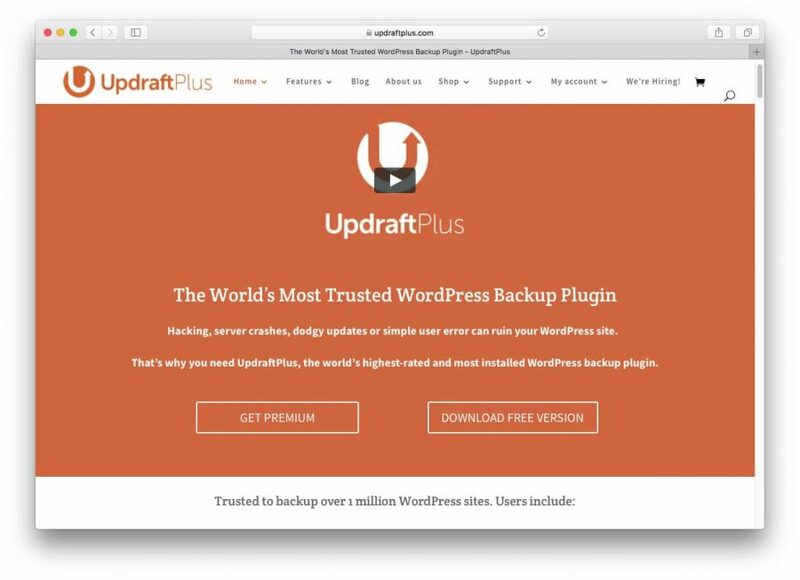 UpdraftPlus is recommended for anyone who values their site – it’s one of the major essential plugins currently available. Finally, we have NextGEN Gallery. Modern website design demands smooth visuals that don’t step on your content’s toes. This plugin is the WordPress gallery plugin of choice for millions of WordPress website owners and developers, and provides a modern way to display your images. The back end offers comprehensive management of your media, much more so than the default Media Library. You also get two front end layouts to choose from, and two design styles. Each of these has a wealth of customization options, meaning you can tailor your gallery to fit your site’s distinct look. For those who need additional functionality, there are also a number of premium extensions available, to help turn your gallery into a full-fledged space to sell and proof your images. Provides powerful image management out of the box. Includes a number of layout designs, all with extensive customizations. Enables you to enhance functionality via premium extensions. For those who deal with images professionally, or who simply want more control over how their images are presented, this NextGEN Gallery is a standout choice. Migrate Guru is a fully automated and free WordPress migration plugin. It offers a clean, smooth and reliable way to move any WordPress site or WordPress multisite network. This plugin runs on BlogVault’s (team behind the plugin) servers. By running on external servers, Migrate Guru doesn’t overload WordPress site, and ensures that sites as large as 200 GB can be transferred without any issues. On top of that, it has a simple 3-step process which is easy to understand even for WordPress beginners. For website owners who want to switch to a different WordPress hosting and freelance WordPress developers. Given the wealth of plugins available, you’d be forgiven for being overwhelmed and confused when it comes to choosing the best WordPress plugins. Of course, choosing the wrong one can have disastrous consequences for your website and traffic numbers. However, by following a stellar guide (such as this one! ), you’ll be able to narrow down your options only to the very best. For example, WooCommerce is the clear go-to choice for creating a powerful e-commerce store, while a plugin such as Wordfence Security is practically a requirement for keeping your website and its visitors safe from malicious attacks. Do you know of any other WordPress plugins that can help improve a WordPress website in 2019? Let us know in the comments section below! Very nice and helpful list of security plugins. I want to recommend User Activity Log Pro. It can track all the activities occurs on the admin side. Thanks for your feedback. If they billed you without any notice, you should issue a chargeback. Hi im using WP-Rocket for a long time, what is the dirty tactic they use? Just for my understanding to getting into this topic! Hostinger.com -> thank you for sharing this article! Yes I need to know every new things( plugins,Themes, Customisation tricks etc) for 2018. I also want to share one more free WordPress plugin called Trash Duplicate And 301 Redirect. It helps to find a duplicate post, pages, custom posts, etc. and delete that duplicates. It also permanently redirect removed content URL to the main URL to divert traffic to one URL and be safe from being penalized by Google for duplicate content. Nice! We may include it to the list. Thanks!